Lockheed Martin and the University of Maryland are partnering to develop an integrated quantum computing platform that has the potential to enhance fields ranging from drug discovery and communications to logistics. The parties signed a memorandum of understanding today establishing the Quantum Engineering Center at the University of Maryland, College Park. 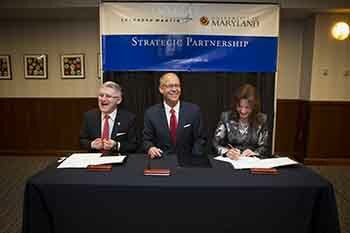 Building on more than 60 years of collaboration, Lockheed Martin and the University of Maryland signed a formal strategic framework in 2010 to jointly pursue research and development projects and business opportunities. The Quantum Engineering Center is the most recent opportunity to push the boundaries of scientific discovery and innovation. The initial goal of the Quantum Engineering Center is to demonstrate a quantum platform that features reliable, well-characterized operation without requiring a user to have a deep understanding of the internal workings of the system—just like conventional computers work today. To achieve this will require close cooperation between scientists and engineers.